You may be wondering how we got our unusual name. 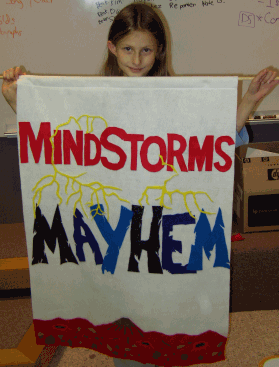 After brainstorming many ideas for names, we decided on Mindstorms Mayhem. The "Mindstorms" part came from the Lego Mindstorms Robotics Invention System technology that we use to build our Lego robots. The word "mayhem" seemed to fit our early programming attempts which sometimes caused the robot to wreak havoc and disorder on the FLL table full of mission models. The meaning of mayhem is immediately obvious to anyone who witnesses the first attempt at line-following on an FLL table full of mission models.